Thanksgiving is over and I hope yours was wonderful. My house is already decorated and ready for Christmas now. I have a little secret for you....but I won't share until Monday. Until then, I will be bringing you some Christmas projects. I made this 6x6 shadow box decoration for myself and I've made a few more for friends too. 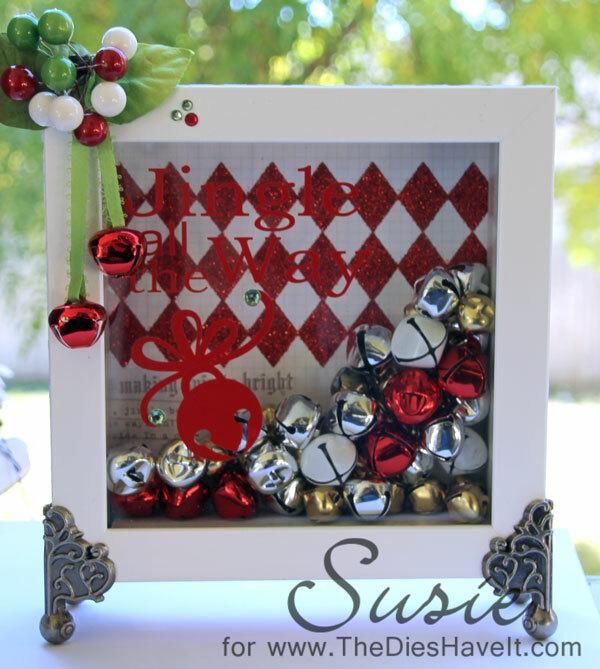 It is just a shadow box with patterned paper on the back, filled with bells with some vinyl lettering on the front of the glass. I loved making this and wonder if you will give it a try too. I am going to show you another version of it tomorrow, so be prepared for another one.